Garter belts and or Suspenders are usually worn just below the navel and measurements should be taken at that point. The length of the straps are derived from this point as well and will be adjustable to hold up stockings short as well as long. Just let us know. Very small charge would be applied. you can judge size, ship back to us and we will add any additional straps and charge accordingly for the added straps and $6 shipping. accordingly for the added straps and shipping. If your hips are more then 10 inches larger then your waist select the next largest size. Firm control Power Net fabric made from 77% nylon, 23% Lycra® with two-way stretch. 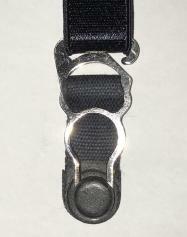 6 ~ 14 Strap cinchers are custom made and are not returnable. Waist to Bottom of Belt were the straps begin is 9"
Black S 23"~26" M 25"~28" L 30"~36" XL 26"~30" 2XL 28"~34"
Red S 23"~28" M 26"~31" L 28"~32" XL 29"~33" 2XL 28"~34"
Measurement from waist to beginning of strap 7 1/2"
We suggest: Purchase without additional straps, we will ship, you can judge size, ship back to us and we will add any additional straps and charge accordingly for the added straps and $6 shipping.